An 84-year-old man affected by arterial hypertension, diabetes mellitus, chronic renal failure on dialysis, chronic ischemic heart disease, permanent atrial fibrillation, previous AICD implantation about one year before, was admitted to the intensive care unit because of typical chest pain and dyspnoea during dialysis treatment with nonspecific ST segment changes at ECG and mild increase of cardiac enzymes. A transthoracic echocardiogram was requested, and it demonstrated a big loculated paracardiac hematoma not easily distinguished from pleural source, with sprays of fibrin localized in correspondence of the free wall of the right ventricle determining a partial compression of the right ventricle with no signs of tamponade. 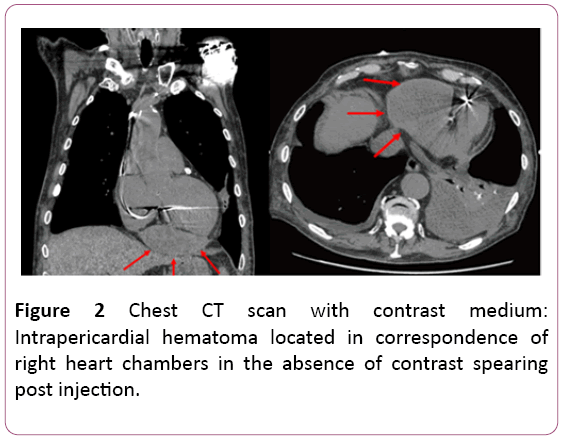 Moreover, a chest CT scan with contrast medium was performed and it confirmed the presence of an intrapericardial hematoma located in correspondence of right heart chambers in the absence of contrast spearing post injection. Subsequently, during the following dialysis treatment the patient developed severe hypotension with chest pain, dyspnoea and paradox pulse treated with liquids infusion with prompt resolution of symptoms followed by a surgical drainage through midline sternotomy. The patient underwent operation and a large organizing thrombus was removed from the pericardial space anterolateral and inferior to the right atrium. The pericardium, which was not thickened, was not removed. His postoperative course was uneventful. 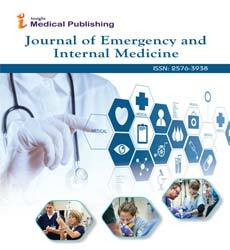 This case shows that an intrapericardial hematoma several months following the initial bleeding can present with evolving clinical features and cause an impaired cardiac filling in condition of volume depletion such as dialysis treatment. Although two-dimensional echocardiography represents the first line diagnostic tool in this condition, chest CT scan with contrast medium is frequently used to evaluate patients for pericardial effusion and it is of value in these cases because it permits differentiation of an extracardiac from an intracavitary mass, precise determination of the extracardiac extent of a mass and characterization of a mass as a probable hematoma. Finally, we can conclude that a very low threshold for requesting complimentary imaging studies is essential for prompt diagnosis, and the selection of the diagnostic test depends on the urgency of the clinical presentation. Furthermore, the noninvasive information allowed the surgical team to plan an optimal approach to excising the mass. Central venous cannulation is widely used in patients with end-stage renal disease when replacement therapy is required. As with all invasive procedures it is associated with a number of recognized complications  and cardiac tamponade is one of them . We describe the case of a patient who presented with an organized intrapericardial hematoma causing localized compression of the right-sided heart chambers during dialysis about three months after central catheter placement in superior vena cava through subclavian vein cannulation. An 84-year-old man with a past medical history of arterial hypertension, diabetes mellitus (insulin therapy arbitrarily suspended about 2 years before), chronic renal failure on dialysis (3 times a week, 3 hours a day), chronic ischemic heart disease (myocardial infarction about 20 years ago not subjected to percutaneous or surgical revascularization), permanent atrial fibrillation, previous AICD implantation about one year before, was admitted to the intensive care unit because of typical chest pain and dyspnoea during dialysis treatment with non-specific ST segment changes at ECG and mild increase of cardiac enzymes. About three months before, during dialysis catheter placement, he reported a self-limited mild pericardial haematic effusion with follow-up medical check prescription. At admission, physical examination revealed a good hemodynamic state. The patient was asymptomatic, afebrile, with a blood pressure of 130/70 mmHg, a heart rate of 70 beats per minute. There was no paradox pulse. Auscultation of the chest revealed decreased vescicular murmur over the whole lung area. At cardiac auscultation there were arrhythmic tones, not S3 or S4 heart sounds, murmurs or rubs appreciated. There was no hepatosplenomegaly, clubbing, cyanosis or edema. The electrocardiogram showed atrial fibrillation to ventricular response average of 70 bpm, ST segment depression in V5 and V6. A transthoracic echocardiogram was requested. It demonstrated dilated left ventricle with reduction of contractile function (EF 38%) with akinesia of posterior and inferior wall and basal and mean segments of posterior interventricular septum. These findings were reported also in a previous echocardiography exam and resulted substantially unchanged. The main remark was a big loculated paracardiac hematoma (9.2 × 4.9 cm), not easily distinguished from pleural source, with sprays of fibrin localized in correspondence of the free wall of the right ventricle determining a partial compression of the right ventricle with no signs of tamponade (Figure 1). We performed a coronary angiography to rule out an acute coronary syndrome and it showed a diffuse not significant coronary artery disease. In order to better estimate the extension of the hematoma and to exclude an active bleeding, we perform a chest CT scan with contrast medium. The exam confirmed the presence of an intrapericardial hematoma located in correspondence of right heart chambers in the absence of contrast spearing post injection. CT scan shows also a bilateral not significant pleural effusion (Figure 2). Figure 2: Chest CT scan with contrast medium: Intrapericardial hematoma located in correspondence of right heart chambers in the absence of contrast spearing post injection. At first, in consideration of clinical stability, in the absence of signs of cardiac tamponade and/or right heart failure we continued medical observation. Subsequently, during the following dialysis treatment the patient developed severe hypotension with chest pain, dyspnoea and paradox pulse treated with liquids infusion with prompt resolution of symptoms followed by a surgical drainage through midline sternotomy. The patient underwent operation and a large organizing thrombus was removed from the pericardial space anterolateral and inferior to the right atrium. The pericardium, which was not thickened, was not removed (Figure 3). His post-operative course was uneventful. Figure 3: Surgical management: Large organizing thrombus removed from the pericardial space anterolateral and inferior to the right atrium. The pericardium, which was not thickened, was not removed. Few previous case reports, regarding on complications after the positioning of a dialysis catheter in superior vena cava, reported intrapericardial hematoma as a possible rare acute and late complication . Although most hematomas tend to spontaneously reabsorb, in some cases surgical treatment may be required . This case shows that an intrapericardial hematoma several months following the initial bleeding can present with evolving clinical features and cause an impaired cardiac filling in condition of volume depletion such as dialysis treatment . Indeed, aemodynamic abnormalities, caused by pericardial effusion, range from undetectable or mild, to life threatening depending on the rate at which the effusion accumulates and the underling cardiac condition. Moreover, pericardial adhesions or organisation of the fluid can result in localised, and thus atypical, tamponade . Moreover, pre-existing heart disease modifies the classic haemodynamics of tamponade. Conditions that greatly increase left ventricular diastolic pressure, atrial septal defect, and aortic regurgitation prevent pulsus paradoxus, even in severe tamponade . Patients with chronic renal disease and pericardial effusion therefore often fail to show pulsus paradoxus . Chuttani et al. studied, in a retrospective series of 29 patients, the echocardiographic features of pericardial effusion after cardiac surgery. Two thirds of the patients had a localized posterior effusion, and collapse of the right atrium or ventricle was seen in a third of the patients, respectively. Clinical findings correlated to the echocardiographic appearances: the clinical signs of tamponade were present in a much higher proportion of patients who had circumferential effusions compared with those with localized effusions. Although two-dimensional echocardiography represents the first line diagnostic tool in this condition, the etiology of the mass, its relation to contiguous structures and its hemodynamic effect can be difficult to assess , also considering that hemorrhage into the pericardial space may accumulate over a restricted region of the heart. In this context, computed tomography is infrequently used to evaluate patients for pericardial effusion even if extracardiac collections of fluid or thrombus may be visualized clearly with this technique  and it has proved valuable in clarifying the nature and extent of extracardiac and intracardiac masses. Adjunctive computed tomography is of value in these cases because it permits differentiation of an extracardiac from an intracavitary mass, precise determination of the extracardiac extent of a mass and characterization of a mass as a probable hematoma by its relative density and response to the intravenous administration of contrast material . Finally, we can conclude that a very low threshold for requesting complimentary imaging studies is essential for prompt diagnosis, and the selection of the diagnostic test depends on the urgency of the clinical presentation. The non-invasive information allowed the surgical team to plan an optimal approach to excising the mass. Mansfield PF, Hohn DC, Fornage BD, Gregurich MA, Ota DM (1994) Complications and failures of subclavianvein catheterization. N Engl J Med331: 1735-1738. Haghighi M, Haghverdi F (2014) Left atrium penetration and tamponade: A rare complication of right subclavian permanent dialysis catheter. J Vasc Access15:139-140. Dunlap TE, Sorkin RP, Mori KW, PopatKD (1982) Massive organized intrapericardial hematoma mimicking constrictive pericarditis. Am Heart J104:1373-1375. Shabetai R (2004) Pericardial effusion: Haemodynamic spectrum. Heart90:255-256. Ionescu A, Wilde P, Karsch KR (2001) Localized pericardial tamponade: difficult echocardiographic diagnosis of a rare complication after cardiac surgery. J Am SocEchocardiogr14:1220-1223. Shabetai R, Fowler NO, GuntherothWG (1970) The hemodynamics of cardiac tamponade and constrictive pericarditis. Am J Cardiol26:480-489. Reddy PS, Curtiss EI, O’Toole JD, Shaver JA (1978) Cardiac tamponade: Hemodynamic observations in man. Circulation58:265-272. Chuttani K, Tischler MD, Pandian NG, Lee RT, MohantyPK(1994) Diagnosis of cardiac tamponade after cardiac surgery: Relations of clinical, echocardiographic and hemodynamic signs. Am Heart J127:913-918. Moncada R, Baker M, Salinas M, Demos TC, Churchill R, et al. (1982) Diagnostic role of computed tomography in pericardial heart disease: congenital defects, thickening,neoplasms, and effusions. Am Heart J103:263-282. 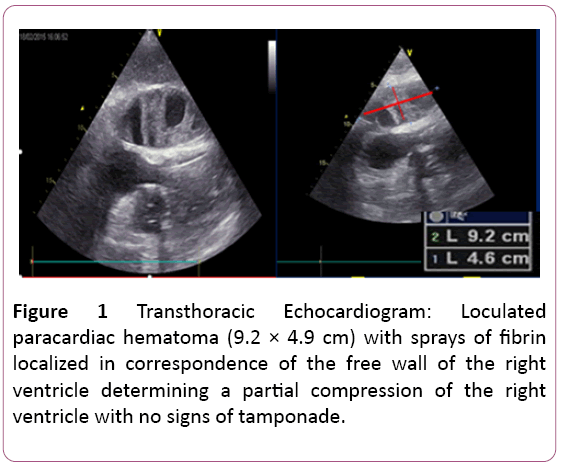 Fyke FE, TancrediRG, Shub C, Julsrud PR, Sheedy PF (1985) Detection of intrapericardial hematoma after open heart surgery: The roles of echocardiography and computed tomography. J Am CollCardiol5:1496-1499.